And check out OUR NEWLY LISTED ITEMS. 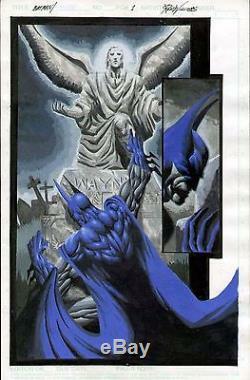 This is an original full-color Batman page by Ron Williams, showing the Dark Knight at the grave site of (presumably) Thomas and Martha Wayne. The artwork is outstanding, and rendered on a piece of standard bristol art board measuring approximately 11" by 17". It is marked Page 1, but we are not sure what it was done for. But it is a really cool piece with a definite Simon Bisley feel to it. Don't miss this chance at a great piece, that would look fantastic framed and prominently displayed. Check out our other auctions for more great items. Check it out, you'll be glad you did! The item "BATMAN ORIGINAL FULL-COLOR PAINTED ART SPLASH PAGE RON WILLIAMS WAYNE GRAVESITE" is in sale since Monday, June 20, 2016. This item is in the category "Collectibles\Comics\Original Comic Art\Splash Pages". The seller is "satchj3" and is located in Brooklyn, New York. This item can be shipped worldwide.